Welcome to the resource center for the Tiva C Series LaunchPad Evaluation Kit! The Tiva C Series TM4C123G LaunchPad Evaluation Kit is a low-cost evaluation platform for ARM® Cortex™-M4F-based microcontrollers from Texas Instruments. The design of the TM4C123G LaunchPad highlights the TM4C123GH6PM microcontroller with a USB 2.0 device interface and hibernation module. The EK-TM4C123GXL also features programmable user buttons and an RGB LED for custom applications. 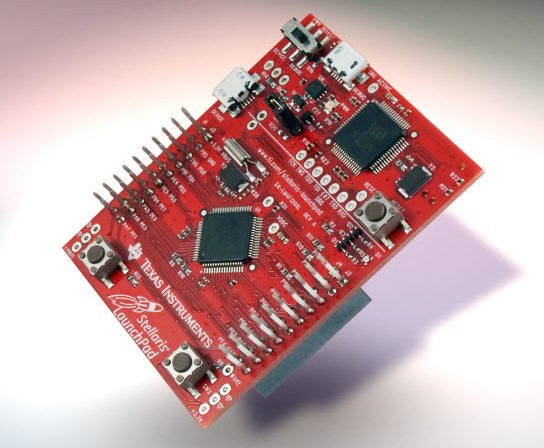 The stackable headers of the Tiva C Series TM4C123G LaunchPad BoosterPack XL Interface make it easy and simple to expand the functionality of the TM4C123G LaunchPad when interfacing to other peripherals with Texas Instruments' MCU BoosterPacks.